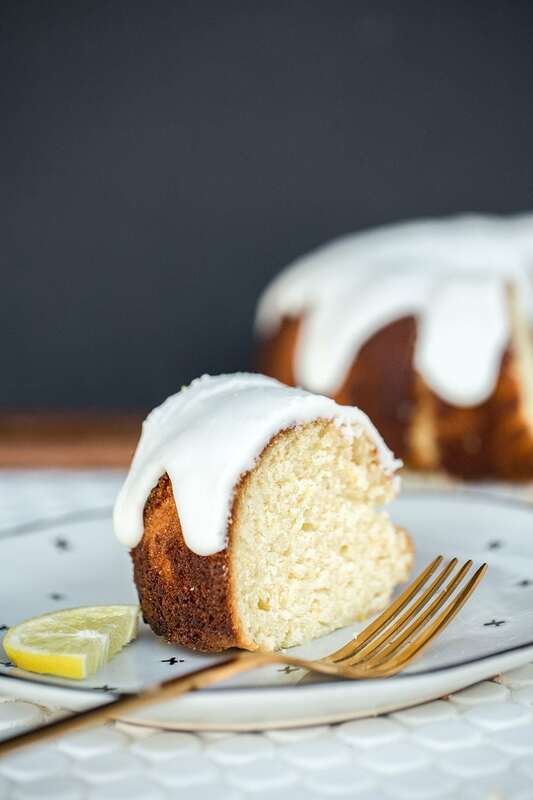 Beautiful and tender Lemon Bundt Cake is full of bright and fresh natural lemon flavor, it's the perfect show stopping cake for any occasion! Taste: Bright and fresh with just the right amount of sweet lemon flavor. Texture: Moist and tender, but not too delicate. Ease: Very easy! The glaze is an extra step, and it’s not completely necessary, but it adds more flavor and moisture to the cake. Pros: Beautiful and vibrant cake. Would I make this again? I’ve already made it a few times now. Sometimes there’s nothing I crave more than the bright, vibrant, and fresh taste and aroma of fresh lemon. As a complete chocoholic, this tends to be a deviation from my usual sweet cravings. Maybe it’s because we just kicked off the New Year and something that feels a little lighter and brighter is in order. Although this cake would be perfect during spring and summer as well. It smells absolutely amazing while it bakes, like the combination of a clean house, a bakery window, and the best candle ever. It’s made with butter, which gives it a rich taste and texture, as well as buttermilk. The buttermilk truly does lend an incredible taste and insanely moist texture. You can learn more about how buttermilk works in baking and about buttermilk substitutions here. If you don’t have buttermilk, you can also use whole milk, though the taste and texture won’t be quite the same. After the cake is done baking it gets a drenching of lemon glaze. This amplifies the citrus flavor and boosts the moisture of the cake. You could skip this step to save time and dishes, but often times it’s the little things that really add up to make show stopping desserts. 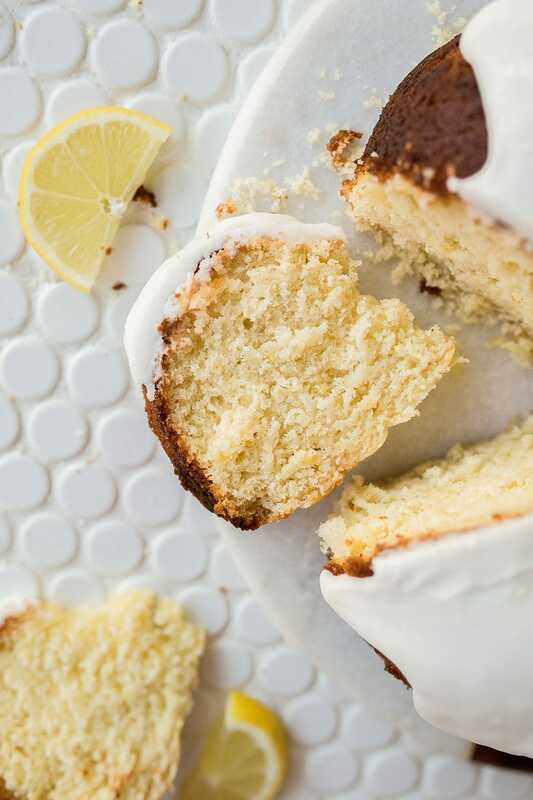 The icing on this Lemon Bundt Cake is just the way I like it: ultra thick and smooth! Feel free to add more cream or lemon juice to thin it out, but I think thick icing makes a bundt cake extra beautiful and gourmet. Just be sure to let the icing set completely before you serve or transport it. The cake will stay good for about 2 days if it’s kept in an airtight container. Don’t refrigerate it, that’ll just dry it out. There’s absolutely nothing worse than spending a bunch of time, energy, and ingredients on a cake only to have it stick to the pan. This is my favorite bundt pan* that cooks beautifully and doesn’t stick. 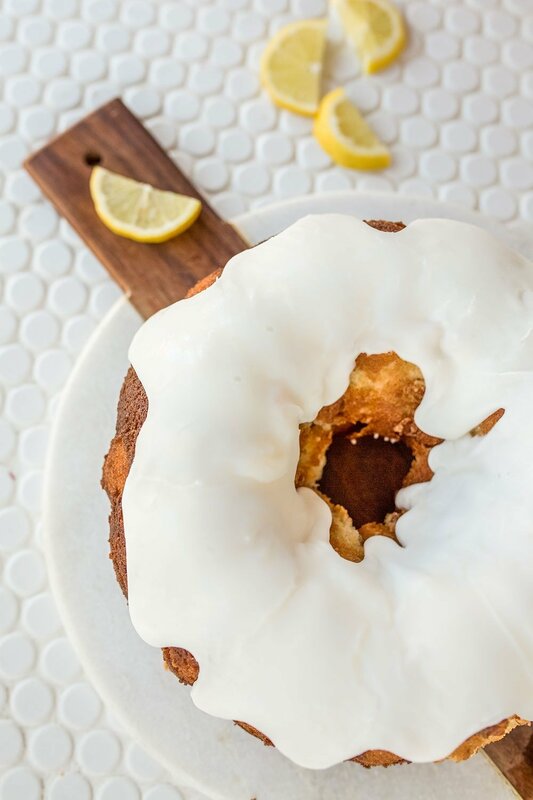 If you make this Lemon Bundt Cake recipe then be sure to snap a picture and share it on Instagram, tagging me and #handletheheat! 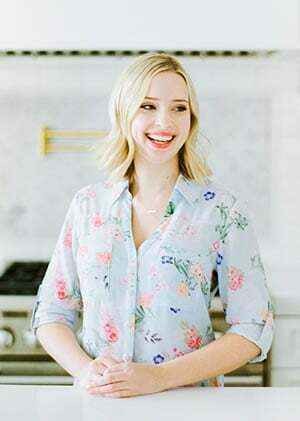 In the bowl of an electric mixer fitted with the paddle attachment, beat the butter and sugar together on medium-high speed until light and fluffy, about 3 minutes. Add the eggs, one at a time, beating after each addition. In a medium bowl combine the flour, baking powder, and salt. Add the flour mixture to the batter in three parts, alternating with the buttermilk, starting and ending with the flour. Add the lemon zest. Mix on low speed until the batter is lump-free. Generously grease a 10 to 12-cup Bundt pan with nonstick cooking spray. Use a pastry brush to grease every nook and granny. Pour the batter into the pan, smoothing the top. Hit the pan against the counter to release any air bubbles. Bake for about 50 to 60 minutes, or until a cake tester inserted into the middle comes out clean. Meanwhile, in a small heatproof bowl combine the lemon juice and sugar. Microwave for 30 seconds, or until the sugar is just dissolved. Set aside. Remove the cake from the oven, and carefully run a thin flexible knife between cake and pan all around the edge. Place the pan upside down on a cooling rack. If the cake drops out of the pan onto the rack, remove the pan. If the cake doesn’t drop onto the rack, let it rest for 5 minutes, then carefully lift the pan off the cake. If the cake still feels like it's sticking, give it another 5 minutes upside down, then very gently shake the pan back and forth to loosen and remove it. Using a pastry brush, brush the glaze over the hot cake. Let it absorb before brushing on more. Repeat until the glaze is gone. Let cool completely. In a small bowl, combine all of the icing ingredients until smooth. Add more powdered sugar tot thicken, or more lemon juice to thin. The glaze should be extremely thick but pourable. Drizzle over the cooled cake. Let the icing set for about 20 minutes before serving. Serve or store in an airtight container at room temperature for up to 2 days. I have a problem with the top of my bundt cakes being hard, but the rest of the cake is soft. Can you tell me why that happens. Thanks. Where did you buy your offset silicone spatula? nice recipe and video, good non-stick tip! Love bundt cakes for entertaining, they just seem like the right thing to serve, and don’t have a lemon recipe. so thank you!